"Go with your love to the fields. Wendell Berry, from The Country of Marriage - from the poem "Manifesto: The Mad Farmer Liberation Front"
I read this on Beyond the Fields We Know - one of her Thursday Poem posts. She has quoted Berry before. I've read a lot of his books - novels, short stories, poetry, and non-fiction. All have themes common in his work, but uncommon anywhere else. For instance, this poem has top soil (and how long it takes to build) mentioned in it before this quote. 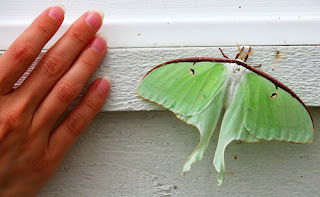 But reading this stanza I had a strong feeling that some parallel image was running under this in my mind, and I realized it was a Luna Moth, recently out of its cocoon. Losing it's mind (shell) and leaving it behind as a false trail. Going to the fields with your love. Practicing resurrection. Every summer I look forward to the appearance of these strange, beautiful creatures. They seem too bizarre and lovely to be real. I saw the first this year just this morning. And then this evening, two blogs before Kerrdelune's with this Berry poem, I was reading about the emergence of yet another moth - a Virginian Tigermoth - on Burning Silo. Echoes. What does it mean? PS - Tents was sold today in the gallery in Hillsborough. This is a distorted shot (monocular vision of cameras and a bad photo angle) but it's the only one I have. I love Luna Moths, but we don't have many in my area. When I see them it is like a small gift. It reminds me of one of my favorite books: Prodigal Summer. I will have to look up Prodigal Summer. I just found and read a review of it - it sounds wonderful.